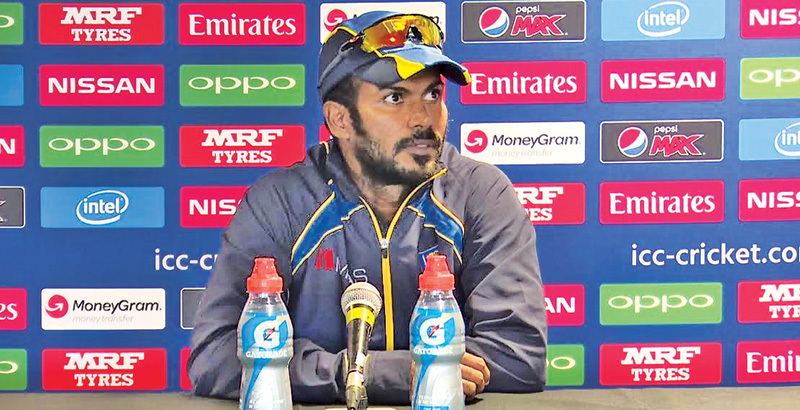 Upul Tharanga addressing the media at the end of the Sri Lanka v New Zealand warm-up match at Birmingham on Tuesday. Sri Lanka batsman Upul Tharanga believes there is no better opportunity for his team’s youngsters to stand up and show the world what they are about than the ICC Champions Trophy. Defeat to New Zealand at Edgbaston on Tuesday ended Sri Lanka’s preparation, though it put up plenty of runs as Tharanga made a century, while Kusal Mendis and Dinesh Chandimal chipped in with 50s. And with South Africa to come just at The Oval on Saturday, the 32-year-old is confident his side now has the right mentality to show what they’re made of on the global stage. “This is the place and the tournament where everyone has to put their hands up, the whole world is looking, and if you can perform really well in this tournament then you get a huge amount of confidence,” he said. “It is exciting, a few of the players have played these tournaments before, but then you’ve got guys like Kusal Mendis, Niroshan Dickwella, who are playing their first major ICC competition. “This is the place where you can show the world that you can be the best. Sri Lanka comes into the tournament as one of the underdogs, an attitude the 2002 co-winner is looking to thrive on when it takes to the field. And with four games’ worth of practice in the country now done and dusted, Tharanga has noticed an improvement match after match, culminating in his own 110 off 104 balls. He added: “These games are about getting confidence and back into form, the batsmen have done really well in this game and the last as well, but the bowlers have had a tough time with the short boundary. “Our fielding has been really good, it’s good to continue doing those good things really well, maybe we have to be a bit more skilful with the ball in the last ten overs, but overall it has been good.